The latest in honky tonk country music from Austin, Texas. Armadillo Road takes you through a journey of sorrow, heartache, and hillbilly hell-raising. With their brilliant melodies, soulfull harmonies, and rich lyrical content, it's easy to get completely absorbed by their music. 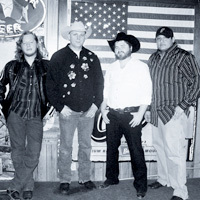 The four-piece band hailing from all parts of Texas have a strong grasp on their southern roots and incorporate regional attributes to make this a well rounded country music band. With their outlaw attitude they rock the honky tonks, yet their ballads have the smoothness to swoon any dance hall. They are not just another country music band, they are a Texas roots band. You haven't heard Texas if you have not heard Armadillo Road.